Food Costs > How Much Does Cotton Candy Cost? How Much Does Cotton Candy Cost? Cotton candy is a type of spun sugar that is light and fluffy and melts in your mouth. A delight to anyone who likes a sweet treat, cotton candy is one of those treats that people look forward to eating during fairs and other special events. After all, it is really difficult to imagine carnivals, fairs and a circus without the sight of kids holding the pink and blue clouds of spun sugar. On average, cotton candy will usually just depend on where you purchase it. Sellers usually sell cotton candy for as low as $1 or as high as $5 per stick if you were to buy it at a local event. Sporting events and other pricey events will tend to be near the higher end, while cotton candy found at a local store or small town fair could be cheaper. 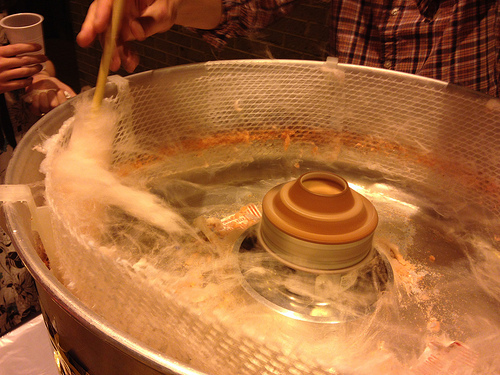 Instead of buying cotton candy, you can create your own cotton candy by using a pre-packaged cotton candy pack. For instance, a brand manufactured by Cotton Candy Express is sold on Amazon.com for $24.95 and includes free shipping. The kit can make an average of 24 to 30 servings per container, which is about 120 to 150 servings per pack. Ready to eat cotton candy, if you want to bypass the making process and eat it straight from the bag, can cost about $1.25 to $2 per three-ounce bag. For instance, Sam’s Club sells a 42 pack of six-ounce ready to eat prepackaged cotton candy bags for $30. On a business level, the cost of cotton candy can cost about $0.05 for the floss sugar and another $0.16 for the cone, bringing the total to about $0.068, according to Cotton Candy Express. If you were to even sell it for $1, you could still see a hefty profit of $0.932. This applies for the pre-packaged cotton candy kits that are sold by different cotton candy manufacturers found online. Like any other products on the market, the brand can affect the price of the product as well as the quality. Some reputable brands, as you will see, will charge higher prices than others. As mentioned, cotton candy stores base their prices based on the location and this greatly affects the competition in the field. As we all know, less competition gives an opportunity for businessmen to charge prices that are above the average range. If buying fresh-spun cotton candy, you will more than likely pay more at an event such as a professional sports game than you will in a setting such as a county fair. For the pre-packaged cotton candy kits that will be bought online, you may need to consider the shipping fees in your purchase, especially if you don’t meet the minimum spending requirements. Other items that will be necessary if making your own cotton candy are the paper cones used to hold it as well as plastic you can wrap the cotton candy with. If you wanted to take it one step further and have your own cotton candy machine at home, the average household model can cost anywhere from $40 to more than $250+. If you are starting a cotton candy business, always know where to look for the best yet cheapest materials for your business. This includes the necessary machines and the flavors needed. $2.00 per cone, 4 dollars a bag with three different colors in it.